Hy-Way Truck Accessories is a privately owned Australian company, we are recognised as one of the leading suppliers of truck accessories in the country. 2014 marks the 50th Anniversary of Hy-Way Truck Accessories. 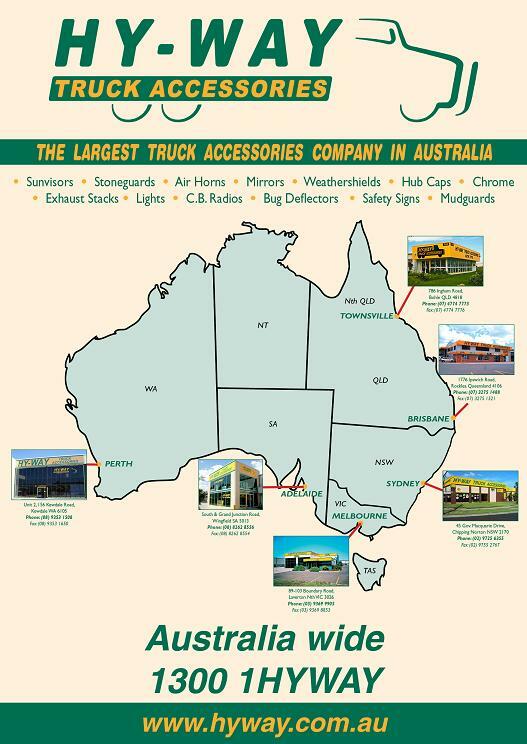 From humble beginnings in 1964 as a supplier and manufacturer of truck accessories Hy-Way Truck Accessories now has retail outlets in Townsville, Brisbane, Sydney, Melbourne, Adelaide and Perth. This wide coverage allows prompt service and delivery to all parts of Australia. As an importer and wholesaler of an extensive range of chrome, lighting, stainless steel and acrylic products this company continues to grow and support the transport industry.